Why would an upset punch would be called 'upset' and when calling it an uppercut seems so much more natural? Maybe because it's upsetting when someone does something like this in a less than desirable manner? Alright, I'll go on record to say there's no one 'right' way to throw a punch. If you see an opening, swing your hand, manage to hit the opponent where you wanted to hit him and not break your hand in the process, hey ... congratulations. But I do reckon that there are ways to do a punch better. Last night we did some close quarter drills which included the 'upset' punch. In our system, we have the first upset punch in Step 15 of Choong-gun. Yeah, yeah, yeah ... that's not how you do your form. Well that's how we do our form - we do a mid yop marki in Step 14, a circular grab and upset punch punch in Step 15 and then a punch in Step 16. While we don't apply it as such, that's the way we perform it in the pattern. So anyway, back to our session - here we are with the drill and we're getting students to control their opponent's elbows, drag the cover out of the way, and then punch generously into their opponent's lats. This way you don't have to hold back too much and people don't get too bruised. Except what I'm seeing from my vantage point is people standing stock still, and moving their arms back and forth like Popeye. 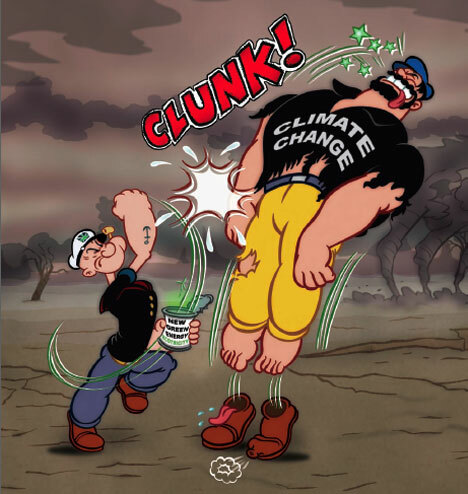 Actually even Popeye supports the strike with good body movement. What I don't want to see is an arm disconnected from the body. The arm is disconnected from the body when it is held so loosely that there's minimal shoulder involvement, the movement is driven mostly by arm power and there's little body rotation supporting the strike. Look at the above boxing picture, the uppercut has the body rotating upwards into the opponents face. The strike comes upward through an opponent, and the elbow is held low so that the mass of the upper body can be sent through the arm into the striking weapon. We mostly achieve a facsimile of this in the form whilst our bodies are upright by bringing the elbow close to the body and tightening our lats. This means that the forward motion of the body can 'connect' with the arm and you are hitting with more than the 5 or so kilos that the arm weighs. Hmm... I'm not too sure about this guy's upset punch. I don't really like to overly criticize other practitioners, but the picture above shows an example of a twin fist upset punch performed done not too differently from how my students were faring last night. The guy's lats don't seem to offer enough stability to the arm, the strike seems a little over extended, and the strike also seems to be traveling in a trajectory outside the body's shoulder frame. I would also recommend angling the strike upwards, if indeed this was performed as a strike. Of course if you were saying it's really supposed to be a takedown, hey, just ignore what I'm saying. Or better yet, associate it with some secret pressure point skill that I'm not privvy to. My top tips to make the punch work for you is to support the strike with your body, to keep the elbow close to your lats, and to angle the strike upwards. If the arms leaves the body and is swung using some shoulder muscle, that does not help optimise the drive your body can create. And if you don't tighten the arm to your frame using your lats/pecs, then you are not maximising the power you can apply into the target. The interesting thing is that the arm doesn't move all that much in relation to the body - meaning if you get the body to move with the arm and decelerate the arm upon impact, that can make for a really solid strike. Check out this kyokushin video. While the arm is not yet extended and when you strike something at such a range, the impact area is the 'box' of the hand, i.e. the lower three knuckles as opposed to the two knuckles used in lunging strikes (with the hand rotated and palm facing downward). If you apply the 'hard weapon to soft target and soft weapon to hard target' rule of thumb, sending this typically untrained part of the hand into the opponent should not reduce it's ability to apply a good amount of power. I agree with your sentiment of the arm not being "disconnected" with the body, but that it should instead by supported by the body for both stability and powerful. However, I am unclear if you differentiate between "upset punch" and "upward punch"? In ITF Taekwon-Do we differentiate between the two. The upward punch is basically an uppercut, while the trajectory of the upset punch is not distinctly upwards, but forwards. Looking at the boxing picture you pasted, that would be labelled an upward punch in ITF, while the technique demonstrated in the Kyukushin video will be labelled an upset punch in ITF. While related techniques, we use somewhat different mechanics for both. For the upward punch there is more of an upward push with the legs, whereas the upset punch receives more of a forward emphasis. The upward punch is also a slightly shorter range attack than the upset punch in ITF, although both are generally used for "in fighting". May I ask where in your forms would you find a distinct example of an upward punch v an upset punch? I'm not sure if I'm liking the upset punch any more knowing that it is performed with more of a forward emphasis. Seems like it's negating the fundamentals of a really powerful basic centreline punch. My initial gut feel would be that rotating the hand downwards would allow me to hit a target at that level (and use my body mass) much more effectively. Saying that, when I work out on a heavy bag, I do perform body blows that hook around and then (like the upset punch you describe) shoot outwards to strike the solar plexus region. 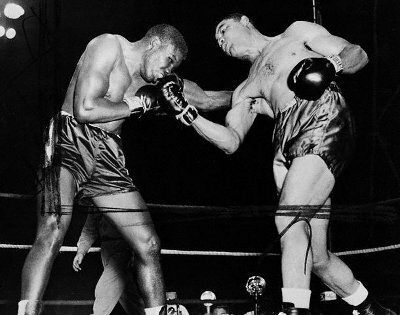 But those centreline punches still get that elbow really close to the body and is supported by tightened lats and pecs. It's not ever done on the shoulder line. Just from the top of my head now, the one in the pattern Hwa-Rang is an upward punch (i.e. uppercut) -- I think movement #5. Then in Gae-Baek there is a upset punch -- I think movement #26.